WHAT: Youth-produced anti-pot PSA videos will compete for cash prizes on the unofficial marijuana holiday of 420, or National Weed Day. The North Coastal Prevention Coalition’s (NCPC) 11th Annual 420 Remix invites students from middle and high schools throughout San Diego County to produce 29-second or 59-second videos with positive drug-free messages. Entry deadline is April 11, 2014. 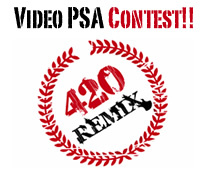 For contest rules, visit the website page: 420 Remix PSA Contest . WHY: Youth marijuana use has been on the rise since 2009. Fewer youth believe that frequent marijuana use is harmful as more youth report using marijuana in the past month, according to the California Healthy Kids Survey. The contest is co-sponsored by San Diego County Friday Night Live, Oceanside Unified School District, the Boys and Girls Club of Oceanside, and Natural High as a way to involve youth in thinking critically about what messages would influence their peers against marijuana use, and to tap into their creativity.